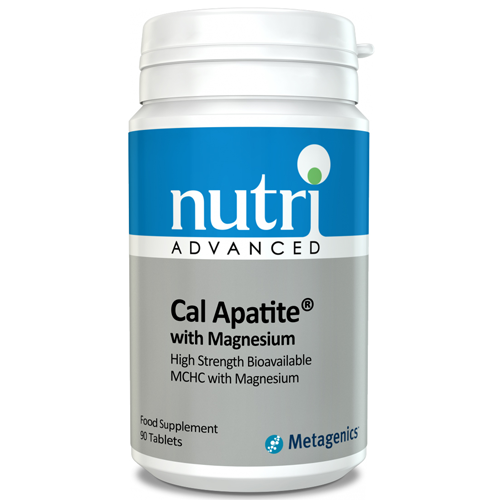 Nutri Advanced Cal Apatite with Magnesium provides 500mg of certified pure, calcium-rich MCHC (Microcrystalline Hydroxyapatite Concentrate) per tablet, with the addition of 100mg magnesium. Magnesium contributes to the maintenance of normal bones with over one-half of the total body stores of magnesium found in bone tissue. 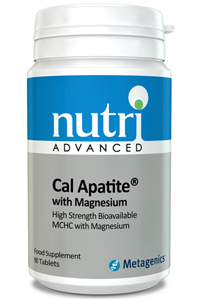 Nutri Advanced Cal Apatite provides a 2:1 calcium to magnesium ratio. Nutri Advanced Magnesium is a blend of bisglycinate and citrate for enhanced absorption. Cal Apatite also features 200iu of vitamin D3. Vitamin D supports normal blood calcium levels and supports normal bone and muscle function. 1-6 tablets daily, or as directed. Tableted with: Microcrystalline cellulose, Silicon dioxide, Sodium carboxymethylcellulose, Stearic acid, Coating (hydroxypropyl-methylcellulose, calcium carbonate, microcrystalline cellulose, stearic acid, talc).